Besides visiting Chiloé’s biggest attractions like city Castro, Museums, UNESCO churches or National Park, we did a volunteer work as well. We were painting classrooms in local elementary school. The day started very early in the morning because we had drove to the school. When we arrived to school, we lined up and introduced ourselves and the states we are from. I felt some of the younger kids were very confused how we are all from United States, but we came from different states. The older kids were repeating the states after us. Then we grouped into four different groups (they had only four classrooms). We got the paint and all the equipment needed for the job and we started to paint. We were painting for about 2 and half hours. Then we took off for lunch. When we came back we painted the second coat. We also had a lot of candies and some students were not big into painting, so they played football (soccer) with local boys. It was greatly spend day and good feeling to help some few children at Chiloé Island. I was in group with another Hope College student Amie Hixon ’18, so we took this picture. 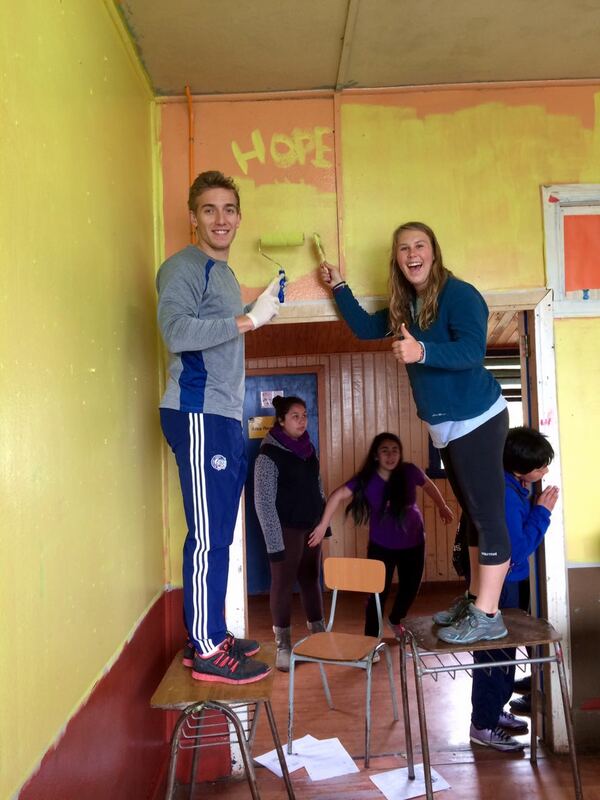 Painting the walls of elementary school in Chiloé.